It was, to say the least, puzzling to see the brewery opt to enter the fray on what seems like a losing side given the current climate; however, unlike Barley Days, I think I have some idea why Cool Brewery has decided to take up Premier Doug’s challenge. First, Cool Brewery has volume. Lots and lots of it. In fact a recent expansion in 2013 saw the brewery extend capacity by 20%, adding four new 330-hectolitre fermenters. They still have a fraction of a macro-brewery’s capacity for volume, but they dwarf the system at Barley Days. The economies of scale at Cool still don’t necessarily make this proposition profitable but they make it slightly more realistic to brew a cheap beer in huge volumes. Second, Cool Brewery has other income sources. The brewery uses much of that capacity to brew beer for other breweries. These breweries can, and do, come to Cool with as little as a marketing plan, a logo, and fistful of money and the brewery makes their beer for them. It’s called contract brewing and if you’re looking to engage in another topic beer people can debate ad nauseam, feel free to dive in here. The short version is that Cool ostensibly rents our their brewhouse, fermentation tanks, kegging line, and canning line to “start ups” so they have other streams of income which presumably might offset the cost of dollar beer in a way Barley Days can’t. However, all these tidbits of information that suggest Cool brewery might be able to approach making a profit from dollar beer if they tried don’t seem to me to get at the important question of why they would bother, but I think I have an answer. Put on your conspiracy theory tinfoil hats. Cool Brewery is embracing buck-a-beer because they want Doug Ford to like them enough to let them sell weed. I know. It sounds crazy right? But consider this. Monday, the same day Cool Brewery announced they would take up Premier Doug’s buck-a-beer challenge, the province of Ontario announced it will allow recreational pot to be sold in retail stores while the province will handle online sales. the Ontario Cannabis Store will not operate any storefronts, but will provide an online channel that will include an age-verification system to ensure safe home delivery of cannabis products. The OCS will also act as a wholesale supplier for private retailers. [Finance Minister Vic] Fedeli said the government will propose creating an official Ontario Cannabis Retail Seal, which will help consumers identify stores where federally qualified cannabis products can be found. Also on Monday, a source told me that neighbours of Cool Brewery have recently been invited to attend an open house to discuss Cool’s plans to produce cannabis oils in their brewing facility. It didn’t seem so far fetched to me that all these things might be connected, so I reached out to Cool Monday evening for comment. I asked why Cool thought they could turn a profit on dollar beer when other brewers couldn’t, I asked if Cool had in fact applied for a variance in order to grow or process medical marijuana on the premises, and I asked how those two businesses might co-exist and what the company might say to critics who might suggest that they’ve taken up the provincial government’s dollar beer challenge in order to curry favour when they’re potentially trying to become a vendor of marijuana for them. I endeavour to be nothing if not educational and informative, so I opted to find you some facts, dear reader. First, there’s this Public Hearing Notice. It’s a notice distributed to neighbours of the brewery about a public hearing that occurred at the Etobicoke Civic Centre on July 18th, inviting Ward 6 residents to weigh in on an application for a minor variance for 164 Evans Avenue (the same address as Cool Brewery) “To permit a medical marihuana production facility within the existing building.” It seems the variance is required because Cool is less than the required 70m from the closest residential property. I liked looking for facts so much, I kept going and tracked down an email from Cool Brewery inviting upset neighbours to the brewery to discuss their plans to produce cannabis oil. That email was sent to neighbours from…wait for it…Yep. Kevin Meens. By this time, I was really having fun with all these factual documents, so I checked out the City of Toronto’s publicly available development applications database and found so many facts. Like this Variance Application signed by Cool Brewery applying for the variance. Basically, I found all manner of facty type facts upon which to base my educational and informative blog post. Per Kevin’s request. Actually, every document related to the request is available on the City of Toronto’s website here if you too are interested. You’ll see it also includes a whole bunch of letters of objection from neighbours, which would explain why the decision on the variance has been deferred. Now, I don’t know. I think Kevin was technically telling me the truth. The letter to neighbours says grow marijuana, but the request is clearly one to process cannabis to make oil. So yes, technically they have “not applied for a variance to grow (or sell) medical or recreational marijuana” and when I gave Kevin a chance to clarify this morning in light of some of my facts, he doubled down on the fact that Cool was not interested “in growing (or selling) medical marijuana.” So while they appear to be attempting to hide behind semantics, publicly-available documentation makes it clear that Cool wants to be doing something with weed, and my guess is they’ll be processing it into oils that will then be sold to other medical marijuana businesses. And so, forgive me for indulging in conspiracy theories, but I feel like buck-a-beer might just be connected (get that tinfoil on again). Maybe, just maybe, when Premier Doug and Minister of Finance Vic Fedele are looking for cannabis (or cannabis oil) suppliers whose products they might want to slap that official Ontario Cannabis Retail Seal on, they might take a friendly look at that second brewery who just opted to support their embattled and silly buck-a-beer announcement. Then again, maybe Cool Brewery just wants to find a way to embark on the two totally-related businesses of providing high-quality medical grade cannabis oil for medicinal purposes while also creating beer for Ontarians who only want to spend $1. Photo by Esteban Lopez on Unsplash. Been following your blog for a while and enjoy it very much. As you know, Cool has been helping breweries across Ontario bring their craft beers to life (for many years). Our core focus is brewing quality beers which are refreshing, easy drinking and affordable. We are proud of the quality of our beers In 2017, Cool lager won Gold at Ontario Brewing Awards and Bronze at Canadian Brewing Awards. We also focus on designing beers (affordable, quality, refreshing) with a point of difference (Stonewall Light in unique 275 mL bottle and 355 slim can and Buzz, the first Hemp beer in Canada). Stonewall won Gold, and Buzz won Silver, at the last Ontario Brewing Awards. The industry shouldn’t be turning inwards on itself. We should be united to work on important issues like allowing on-site brewery outlets to sell for less than provincial pricing (if they so choose). This will drive business to the brewery. We should be working on lowering taxes, which can account for almost 35% of the cost of beer, and TBS/LCBO fees which can account for between 16-30% of the cost (pending the retail price of the beer and the breweries CRA tax level). Beer drinkers will drink what they like when they like and buy from whom they like: that’s the beauty of a free market. The best beer is always…the next one. Kevin – I’m sure many would agree with you about your comments about brewers banding together to work towards common goals and opportunities to improve the overall beer market with this new government. You may want to read this article about the fate of the last brewery who sold Buck a Beer in Ontario…https://www.macleans.ca/opinion/why-buck-a-beer-failed-before-in-ontario-and-why-it-likely-will-again/. As you said – it’s a free market. The fate of Lakeport was an absolute success. The shareholders walked away rich and the CEO became (if she wasn’t already) a millionaire many times over. I don’t know how much better of a result you could possibly want as a business owner or shareholder, other than having the company become large enough to swallow up the other Macrobrewers and exercising monopoly power. If anyone can replicate what happened to Lakeport they should be applauded. They fired 140 people. I’d like to think that some people who start companies feel remorse when the humans who helped build the company are laid off, regardless of how it effects their personal bottom line. LOL Have you ever driven down the Gardner with your eyes open? If you have you would have noticed the massive adverts Cool has with Cannabis leaves. It’s been bloody obvious for a long time Cool wants to be doing something with weed. No digging up facts necessary. Cool has been brewing Millenium Buzz since 2003, 15 years before legalized weed was ever envisioned in Ontario. It’s brewed with hemp, according to their website. 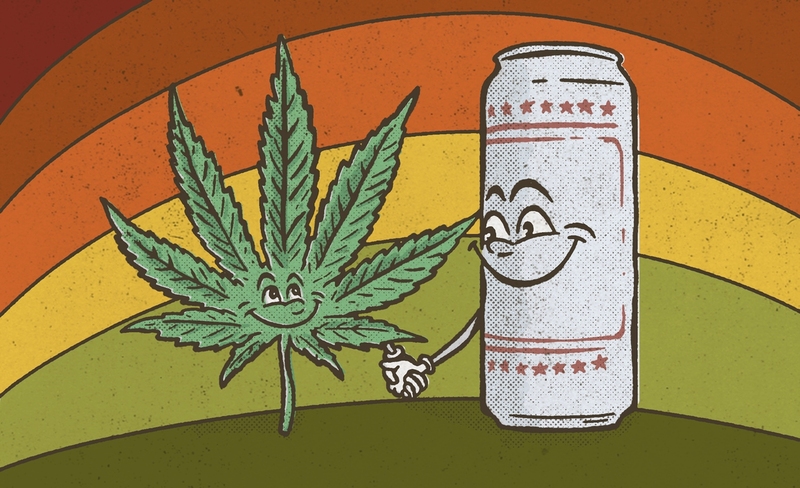 The facts that Ben so diligently researched point to a link between buck a beer and furthering their agenda for marijuana licensing in the 2018 landscape. Just saw this. If the industry wasn’t in the shitter, you should have become a reporter. This is both excellent and impressive.